The celebration began before the sun had even set in Los Angeles. By the time the final buzzer sounded and the Kings had piled on goalie Jonathan Quick, a crowd began to gather in the small plaza outside Staples Center. The party was smaller than it would have been Wednesday. With the Kings on the brink of a sweep of the Eastern Conference champion New Jersey Devils last week, the area of bars and restaurants nestled around Staples, a hyper-modern “entertainment complex” known as L.A. Live (also home to Grantland’s offices), was at a fever pitch. The first jerseys showed up at noon that day, and lines for anywhere with a beer and a TV were 50 deep. The crowds were smaller Monday night, but those who did show up were hungry for a win. The Kings entered Game 6 of the Stanley Cup finals with a 3-2 series lead, but they had dropped two straight, and the tension surrounding the game was hinging on desperation. 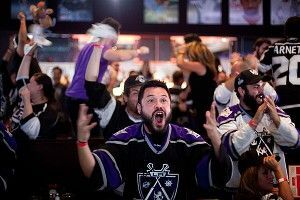 When Dustin Brown scored first during a five-minute power play in the opening period, the fans who packed L.A. Live’s largest sports bar celebrated like it was a goal. When Jeff Carter scored second just 1:42 later, they celebrated like it was a championship. As those two goals turned into four, it was clear things were over. By the time the second period had ended, police officers lined the streets for two blocks around the arena. The plaza in the middle of L.A. Live, which had a beer garden and radio DJ before the puck dropped, had long been cleared out. 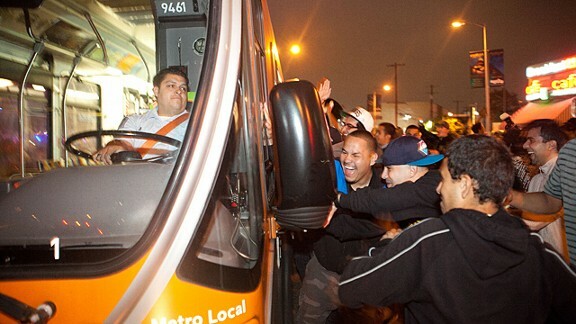 It was obvious the Los Angeles Police Department was doing everything it could to prevent the rioting that took place following the Lakers’ title in 2010, and this was the first step. The plan was successful, in part. When the game ended, people filtered out toward a plaza just outside the arena. While those inside Staples remained to see the Stanley Cup ceremony, those outside were spurred on by the television cameras to celebrate on their own. What started as a few dozen people slowly turned into a couple hundred, and chants of “Go Kings go!” and “We got the Cup!” mixed with drunken renditions of “We Are the Champions.” As that crowd grew, police attempted to keep it separate from another one that was growing on nearby Figueroa Street. It took about five minutes for the crowd of hundreds to realize a handful of cops wouldn’t hold them, and soon everyone had packed in close. The hordes merged, and the rowdiness picked up a bit. One guy managed to climb and ride a statue of Magic Johnson for a good 30 seconds before police converged around him. By about 7:30 p.m., the smell of marijuana hung in the air, an actual mosh pit had formed, and a girl, who couldn’t have been more than 5 feet tall, was giving the finger to a police helicopter that circled overhead. All together, the scene was relatively innocuous. Drunk young people did what drunk people do, as the police slowly attempted to push the crowd out of the plaza. Everyone seemed happy to oblige — as long as the party was allowed to fizzle out. By 9 p.m., about an hour after the game ended, most fans has filtered away from the stadium and onto the streets. The masses moving away from Staples were met on the surrounding corners by those who were moving toward it. A few blocks in each direction, pockets of people were doing their best to get as close as they could to history. They were young and old — some who’d clearly waited half a century for this and some who probably hadn’t waited more than a couple weeks. Still, they all hoped to be part of something, and the heavy police presence wasn’t much of a deterrent. The sounds of honking horns and cheers filled the streets. The sun had long set. No one seemed too eager to leave.